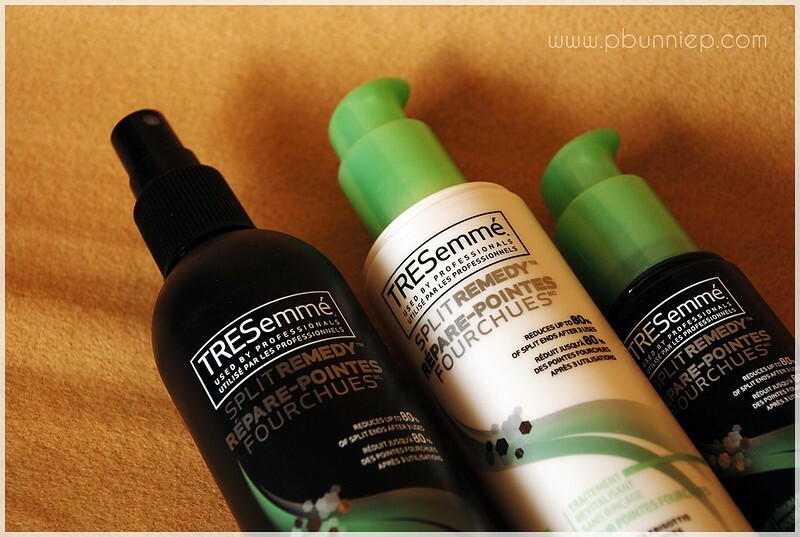 TRESemme has always been the hair care line that catches my eye in the beauty aisle because of their claim to be professional products at affordable prices. They also know how to stir up interest by continuously releasing new lines and products. So when the Split End Remedy series released a few months ago, you bet I was all over it. As someone who's drawn to long hair, I know how it can get ravaged simply by day to day wear. While not all hair products are made equal, it's often the ingredients and not solely the price that define it's quality and performance. Now days when I see a new product, I instinctively flip it over to scan across the ingredients list. For hair care, I'm always looking for more natural additives, a touch of silicone and as little alcohol as possible. Reappearing ingredients in the Split End Remedy line include; hydrolyzed keratin (the building blocks of hair and nails), panthenol (moisturizes and smoothes) and biotin (b-vitamin found in hair/nail growth supplements). Intrigued by this, I eventually ended up with all three of their post shower treatment products. Since there doesn't seem to be any clear instruction on the steps to using the items, I've listed then in the order that I would use it personally. 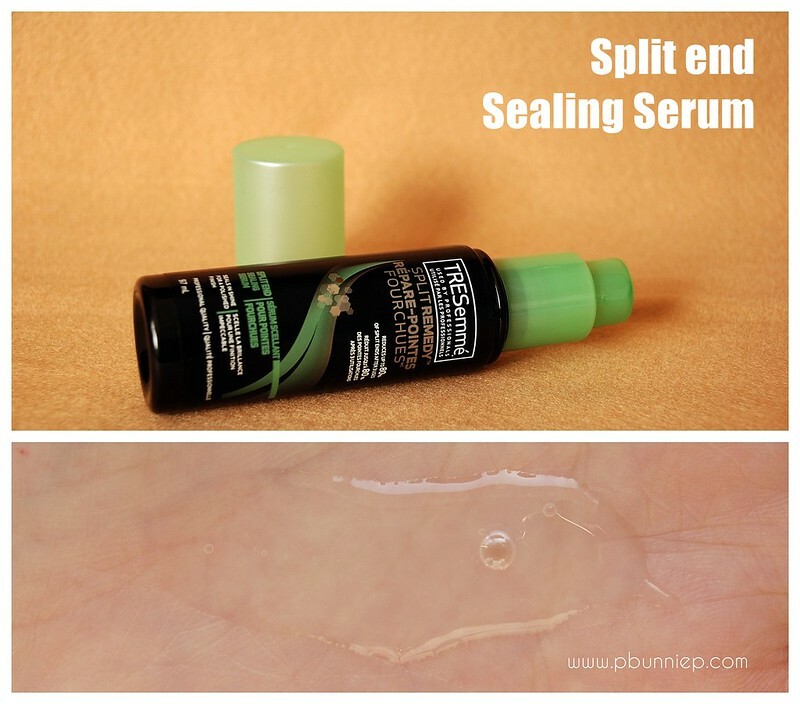 The Sealing Serum seemed to be the right product to start with first (after towel drying my hair), I'd take one pump into my palm, rub my hands together and press the product from my ends upwards towards mid shaft. As split ends occur from the bottom up, this seemed like the right thing to do. With the word "sealing" in there, I had expected this to be sticky and thick almost like a gel but was surprised at the light fluid consistency which also absorbed instantaneously into my hair. 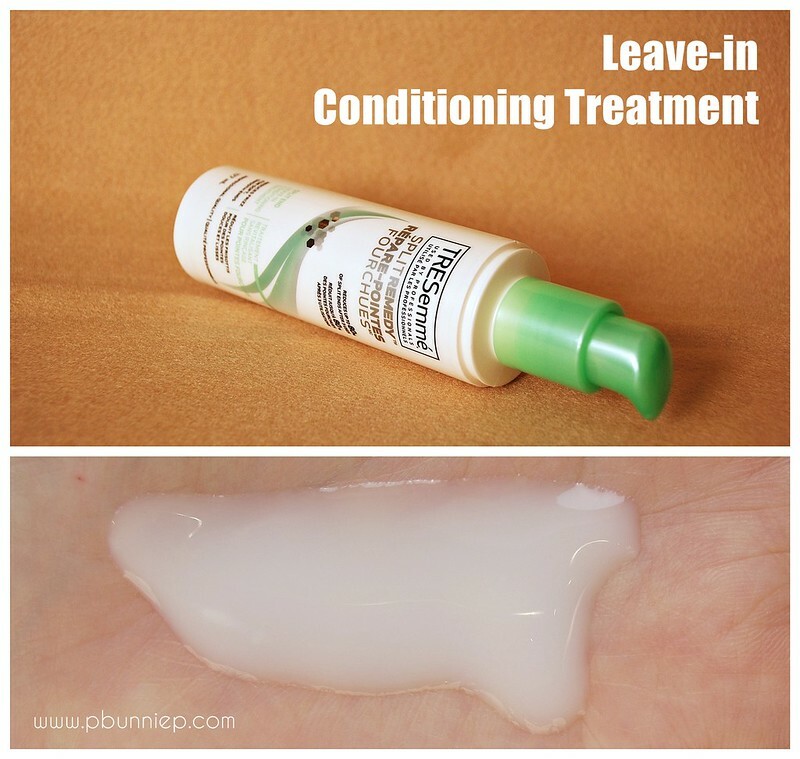 It made the tips of my hair look smooth and neat without leaving any residue at all. On a casual day, I'd apply this Conditioning Spray straight after the serum and to be honest I'm not quite certain what it's supposed to do. Expecting a watery spray like the TRESemme Heat Tamer, all I got was a diluted pearly liquid that dispensed awkwardly from the pump bottle. Perhaps they should have stuck to the pull trigger bottle rather than the pump but it was nearly impossible to get my hair coated evenly because it dispensed too much product in one area. Technical difficulties aside, I didn't find the spray to have much effect on my hair at all so I'm putting this in the category of "detangling spray" or a very light leave-in for fine oily hair. This felt super light in my hair and didn't weigh it down although it didn't do much for it either. This product can go. Back to end on a good note, the Condition Treatment is something I do like and I've been using it faithfully for the past month or so, after applying the serum. It has a lotion creme consistency that feels moisturizing on my hair and by some strange power makes my hair dry 1/3 faster than before. Even when used on its own, it seems to lightly smooth my hair and make it sleek and soft with a soft sheen. 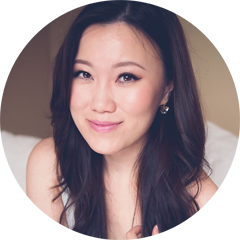 The consistent result is naturally soft and smooth hair that feels good when you (or someone else) run your fingers through it. 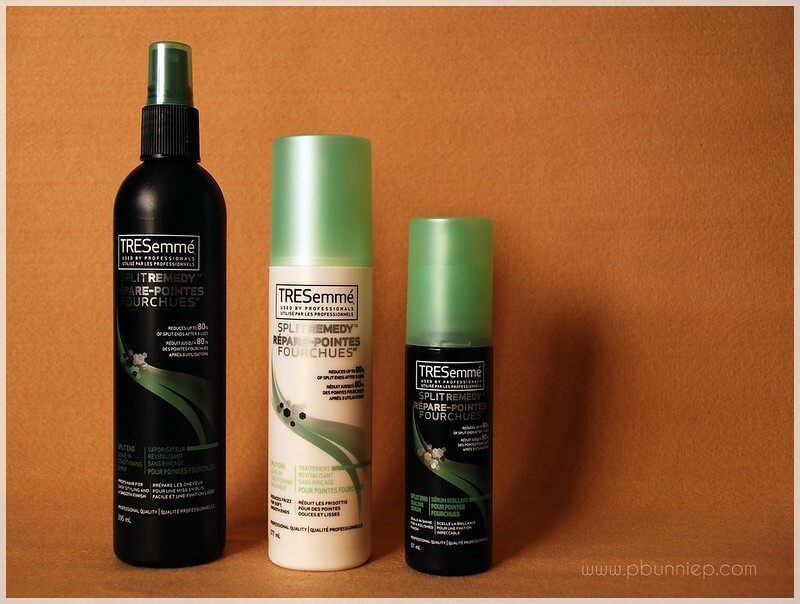 Altogether the Split End Remedy line would be good for those with fine/normal or oily hair that wants something nourishing yet light in texture. Go for the serum and add on either the spray or lotion treatment to suit your moisture needs (it isn't necessary to use all three). 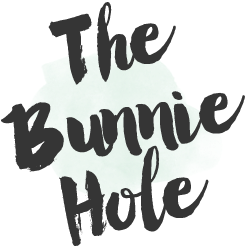 At this amazing drugstore price coupled with the impressive ingredients list, it's quite a bargain and worth a test run. This set may not be strong enough for my Canadian winter needs (heaters inside, wind and rain outside) but will definitely be a welcomed guest in my hair basket. Anyone else tried the Split End Remedy line too? Your reviews are so helpful.